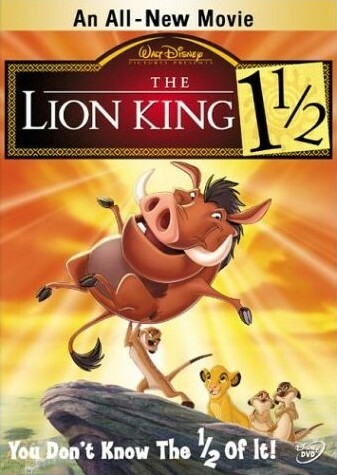 The Lion King 1½, known internationally as The Lion King 3: Hakuna Matata, is a prequel and midquel to The Lion King. "The Circle of Life begins anew" as Timon (Nathan Lane) and Pumbaa (Ernie Sabella) narrate the story of The Lion King from a different perspective. Timon and Pumbaa rewind the story of The Lion King to the tale of Timon, a meerkat who has trouble fitting in with the rest of his meerkat colony. When Timon decides to leave his past behind and find a new home, he meets Rafiki (Robert Guillaume), who tells him to look "beyond what you see". Taking things literally, Timon sets on a quest to look for a home that will never be in his view. Through this journey he meets Pumbaa and an "acquaintance-ship" is born. When the Hakuna Matata gang meets Simba, the movie takes a turn and explains the story of The Lion King from the perspective of Timon and Pumbaa. The Lion King 1½ script can be found at The Lion King WWW Archive in HTML format. Thanks to The Lion King WWW Archive for hosting this document.